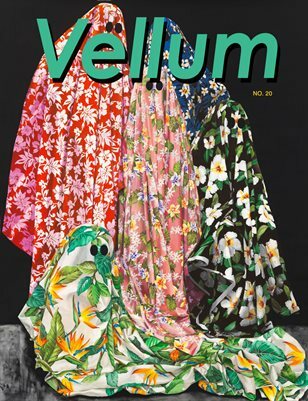 Vellum #20 features Gilles Barbier, a French artist who revels in satirical commentary. Through paintings, sculptures and installations he creates singular vignettes that spew with comical clarity and reveal the darker side of humanity. Other features include "Transmission", a curated exhibition in the mag which brings together eight artists who comment on how we send/receive messages and Rusty Fox a Macau artist who uses documentary photo techniques to depict a 'blank society'. Reviews include: :LA Art Show, Armory Week and Art fair Tokyo.